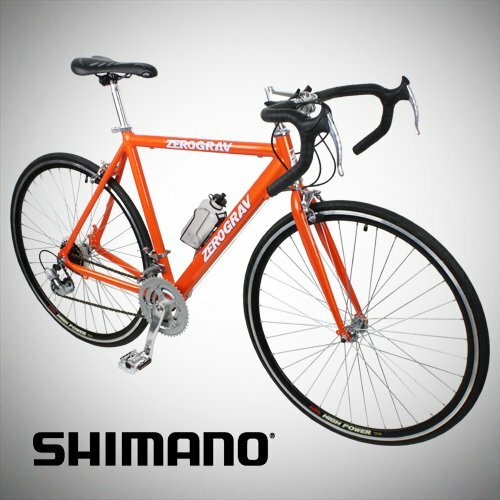 The 21 Speed Shimano Road Bike is an entry level track ready bi-cycle which can be used for commuting, exercise or solely for riding. It comes with a strong but lightweight aluminium frameset. This makes the bike super-light as well as more agile and robust. Adjustable seatpost and handle bars allow the riders to tune it up according to their riding styles resulting in superior comfort and ease of use. It uses Shimano A050 21 speed shifters and Shimano dereilleurs which contribute significantly in improving the performance of this bi-cycle. The wide gear range comprising 21 speeds offers the ultimate riding experience in any terrain. It is delivered 85% assembled and comes with a free water bottle as well as a water bottle holder. The bike comes with 6061 Aluminium Frameset (700Cx 21 inches) with a 700CC steel fork; 22.2 millimetre handlebar (W 420 millimetre); 22×180, Ext:80 Handle Stem; Shimano TZ31 front derailleur; Shimano A050 rear derailleur; Shimano MF-TZ07, 7 Speed Freewheel (14-28T); Alloy RA 3.2A brake levers; HS-14 Alloy Double walled rim (700cx1.5 A/V); Alloy AE-241F front hub and Alloy AE-241R rear hub; Alloy 31.8 millimetre seatpost; Alloy 9/16 inches pedals with ball and 13G length spokes with steel cap. Shimano A050 shifters make the shifting faster and seamless while the AS-2.4D Alloy Caliper brakes offer shear braking power with precision control. If you are looking for a commuter bike with smooth ride quality and ease of handling, the Shimano Aluminium 21 Speed Road Bike can be just the thing for you. The aluminium frameset makes the bike weigh only 25 pounds and as a result, it is extremely easy to handle. The bike is delivered 85% factory assembled and gearing it up for the rides is extremely easy if you have done something like this before. In case you face any difficulty, be sure to visit your local bike shop. Apart from that, everything else works as expected. The brakes are good and they can bring the bike to a quick halt. 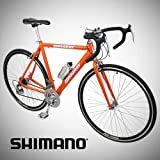 Overall, the bike is great for beginners who are trying to get started with biking and are looking for a ride within a small budget which offers good performance. The bike serves as an excellent alternative commuter vehicle and it is definitely worth giving this one a try.